B7Dt Est modernized car nicknamed “Romilly”. The brand is De Massini, but the underbody is also signed LS Models, as well as the box. Y2 bogies. I would have preferred at least one car on “wagon-lits” bogies. Bogies, buffers and gangways are made of bright material which must absolutely be painted. The inner bogie beams rebel like on the LS Models cars and rub on the wheels. Stains on the body, glue traces between body and chassis, a buffer is twisted. The special central handrails on the van side are not planned. However, they are different because the van door central bar was removable for loading bulky packages. See Christophe Dufrenoy’s comment on the Loco Revue forum. 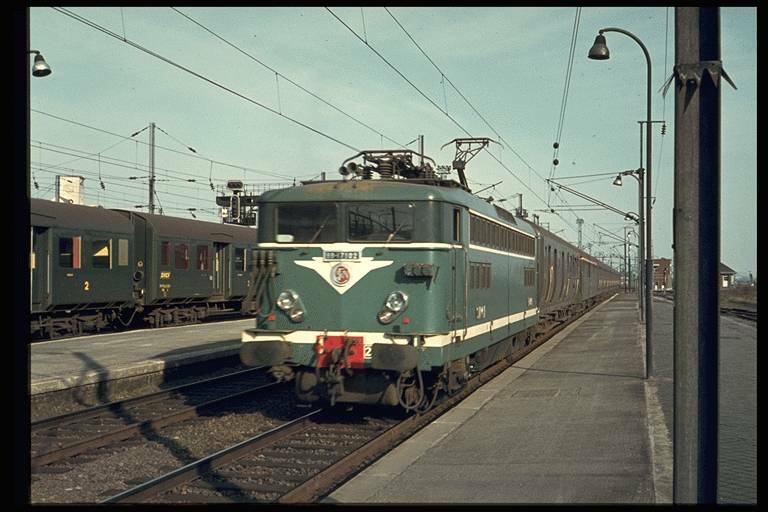 As for the curtains, I found various information on their colour — grey or brown, but this extract of J. P. Lescat’s photo found on RailFanEurope shows at least one red curtain! See the Loco Revue forum. Buffer glued, guard rails, steps, dynamo belt, electric heating cables mounted. Interior bogie beams glued. Brass bearings for current pickup, installation of lighting and lanterns controlled by bistable reed switch. Seats painted. Interior walls and partitions made of ivory coloured paper. Bogies, axles, buffers and platforms painted. Gangway handrails remade in metal. Parcels in the van. These cars come from the metallization between 1957 and 1962 of 676 old TY cars built from 1907 to 1923 for most of the old railway companies. This work was carried out in the SNCF workshops in Romilly (among others), hence the nickname attributed to these cars. They were originally equipped with “wagon-lits” bogies (photo), but some were later equipped with Pennsylvania Y2 or Y16 bogies. Service withdrawal between 1978 and 1985. Loco-Revue No. 512 (02/89) p. 146. Loco-Revue Special Issue 2005-01, p. 38. (document presented by EC64 on the Loco Revue forum).